The arrival of the fall season comes a fresh set of event design trends that gets both wedding couple’s and vendors excited. We’re expecting to see new color inspiration this season as well as changes to theme and décor. Plus, there’s always the inevitable farewell to some of last year’s popular fall event design trends. So what does this fall season have in store for event design trends? Here’s a sneak peek at some of the biggest design trends for this fall season! The last few seasons have favored more neutrals and soft tones over color. 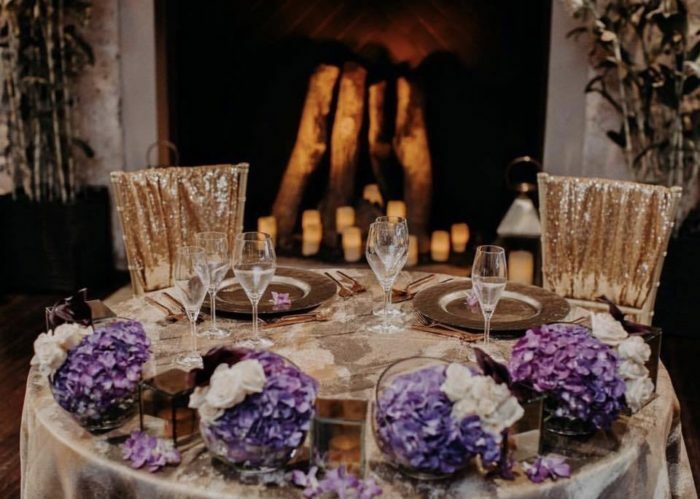 However, those getting married during the cooler months are opting for a bolder color palette right now in both their florals and linens. What’s not going anywhere? Mixed metals. This trend has been strong the last few years, and doesn’t appear to be losing steam anytime soon. Gold, silver, and especially rose gold are in high demand for everything from candle holders to flatware to cakes. It gives off that perfect romantic and intimate feeling no matter how large the guest list is. The dance floor is no longer the only fun after-dinner activity. Whiskey tastings and cigar rolling stations are increasing in popularity. These stations give guests a plethora of choices in how they want to enjoy the celebration. There are countless options for which type of station to select, so make it a personal choice that reflects your personality as well as the design and style of the event. It always happens that some trends have to retire. Mason jars are on the way out. They are really only being used for rustic rehearsal dinners and more casual weddings. Burlap and lace are also becoming less and less popular as more modern metals and greenery take their place. Autumn is an easy time to plan a themed wedding with holidays such as Halloween and Thanksgiving approaching. However, wedding couples are no longer taking themes so literally and instead keeping it subtle and thoughtful. For example, pumpkins will definitely continue to be used throughout the fall season, but instead of having them as centerpieces, guests will be served pumpkin pie for dessert. This year is certainly going to be a fall to remember, and we can’t wait to see what new design trends we will see next!